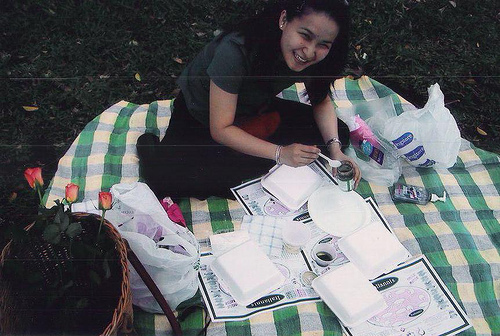 I’m glad that I was able to get a picture of this Tagaytay Picnic way back in 2001. Rache was still in denial at this time and she gave me the precious “yes” a few months after. This was Valentine’s Day. I was still courting Rache and she agreed to have lunch with me on Valentine’s Day. 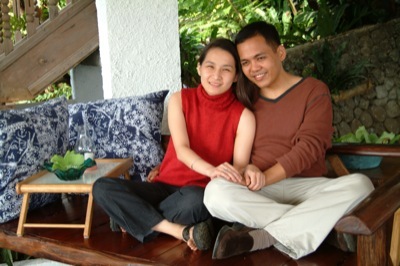 Little did she know that my plan was to drive her all the way to Tagaytay and be back by 2 p.m. in the office. I asked my friend Grace to help me buy the picnic basket, the picnic cloth and how to setup the entire lunch. I bought three roses, our favorite Italianni’s Chicken Parmigiana and a surprise cellphone gift (hehe). This was so memorable and I will never forget this “kilig” moment. I have been to Kubli springs three times already and I can’t stop raving about the experience. 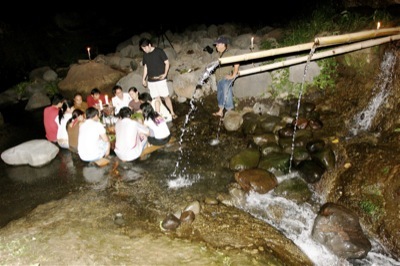 Imagine eating in a spring in the middle of nowhere (literally) with great gourmet food cooked before your very eyes. You drink the cold water from the springs and if you are adventurous you get to take a bath in pure mineral water. You spend the entire night singing with an acoustic guitar over the Best Lambanog that I have ever tasted or Cafe Barako brewed uniquely by Jay. Ever since I started blogging, Claude Tayag’s Bale Dutung meal was on top of my list. 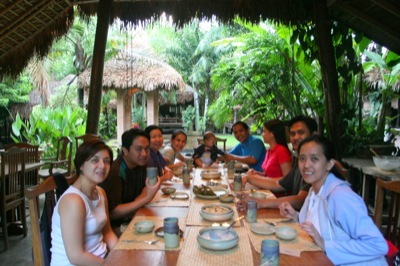 Also, I’ve always wanted to go on a food trip with fellow foodie bloggers Nena, Wysgal, Joey and our friend, Spanky. 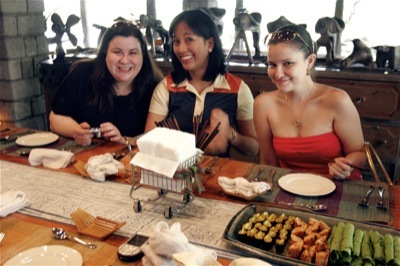 Our Claude Tayag lunch was perfect — cold towels sprinkled with baby cologne, Pampanga’s comfort food served in Claude Tayag’s artistic style, a foodie EB like no other! We wasted the four-hour lunch taking pictures of Bale Dutung and listening to stories by Claude. 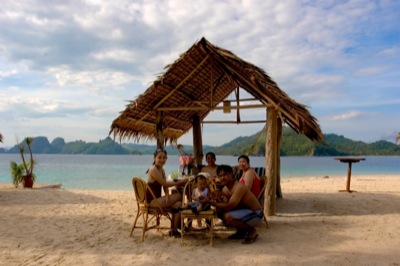 If you have never been to El Nido and arrange for a breakfast, lunch or dinner exclusively on one of the islands, then you are missing on one of the awesome experiences — only in the Philippines! It feels for a moment that you own the island and you can do what ever you want — swim, eat with your hands, lie on the sand, or just simply waste the time away. The best part is everything is setup by El Nido resort and you don’t have to worry about cleaning up after. 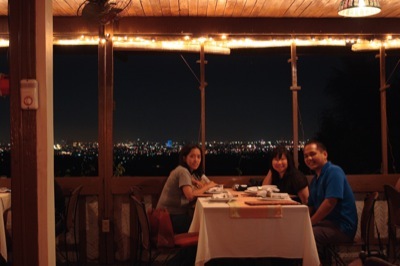 I can’t stop raving about Vieux Chalet because in its 20+ years of existence, it was able to manage to serve the best gourmet dishes with a romantic view of Manila. The pastas, bread, and milk are home made by the owner. Everything is freshly cooked with fresh ingredients for a memorable gourmet meal. Surprisingly, still not a lot of people have been to this place and continues to be Antipolo’s secret hideaway literally a house-on-a-hill. After discovering Ugu Bigyan in Quezon, it was been my quest to find the best restaurants in the Philippines. I firmly believe that Philippines has the best restaurants out there — perfect ambiance, awesome food, and excellent service. Until now, I never ran out of restaurants to explore. If you haven’t been to Ugu, you should try Ugu’s kulawu and lato salad. We love Ugu Bigyan! We never forget La Cocina de Tita Moning not only because of her Bread Pudding and the Paella, but also because of the entire Old Mansion House dining experience. I missed this moment when Brobo (older brother, Lorenz) was still based in the Philippines and we would eat together as a family. This Malacanang Mansion serves one of the best Spanish food in the Philippines. Ever since we discovered Antonio’s before we got married last Jan 2003, Antonio’s remains to be the no. 1 restaurant in the Philippines. I can still remember the first time we tasted Antonio’s salad with creme brulee, simple, tasty gourmet meals and the desserts with our wedding entourage, we were all raving about it. 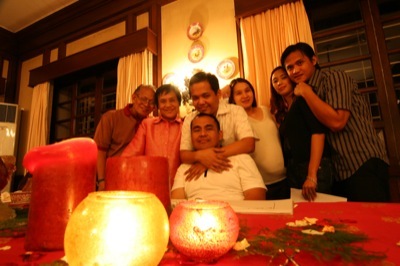 We also are proud of our pre-nuptial shots in Antonio’s. How I wish I took a shot of our first ever Lolo Dads’ experience. Funny thing is we thought Lolo Dads was a grill place so I was so proud to treat Rache for a date. After entering, we found out that it was a fine dining place, and we ended up paying P1,000+/head. We’ve been laughing about this experience ever since. Lovely list of places to travel to and to eat. And Anton, you're such a romantic. You should do workshops for guys! I agree with Mila. I don't think I've ever met a guy as sweet, thoughtful and romantic as you, Anton! Rache and you are lucky to have each other. And, like Christine, I also believe that the company I'm with is what makes meals most special. As much as I love good food, I love good company a lot more. You have eaten in so many great places Anton, but I think nothing beats that picnic grove meal :) My heart jumped...what great memories...and such a sweet picture of Rache! hay naku, Anton your putting all our "men" to shame... sigh. food after all is best enjoyed with people you want to share the experience with right? When I was at isla naburot, it was mango season. the most beautiful mangoes in the world are to be had there. your wife is very lucky to have a very thoughtful and adventurous husband! I agree that you should give a seminar to guys, especially those married and soon to be weds. I love your blog, I will now look at your blog for reference of restaurants. My husband is so boring when it comes to food, won't try anything new so we would both have to look at your blog for directions. More power! Where is Kubli Springs? How do you make a reservation to eat their gourmet food by the springs? A wonderful family vacation in Barbados during Spring Break, 2006 concluded with an impromtu repas on the beach in front of the small inn where we were staying. Several young, typically friendly, Bajan fisherman who had befriended our family during our stay prepared hot breadfruit which was offered to us as we emerged from our "last swim of the holiday". Wanting to contribute to the event, we raided our refrigerator. There was not much left after the holiday except for a dish of roasted garlic heads and a bottle of hot sauce! The breadfruit,cooked on coals on an outdoor fire on the beach were cracked open and pieces were passed to all. Warm, comforting and very tasty1 We passed around the roasted garlic, which was initially viewed rather suspiciously by our hosts! The new experience of hot breadfruit for the Spencer family and roasted garlic for our Bajan friends,was confirmation, once again, how friendship and food go hand in hand.